1.1 This Standard Radio System Plan (SRSP) states the minimum technical requirements to operate narrowband personal communications services (PCS) for the purpose of efficient spectrum utilization in the bands 901-902 MHz, 930-931 MHz and 940-941 MHz. 1.2 Radio systems conforming to the requirements contained in this SRSP will take priority in licensing and coordination over non-standard systems. 1.3 The arrangements for non-standard systems are outlined in the Spectrum Policy SP-GEN (see 3.1.4). 2.1 Equipment used for narrowband PCS systems operating in the above bands must comply with the technical standard RSS-134. 2.2 Notwithstanding the fact that a system satisfies the requirements of this SRSP, the Department shall require adjustment to radio and auxiliary equipment in radio stations whenever harmful interference1 is caused to any radio station operating in accordance with Departmental regulations or standards. 3.1.1 Radio Standards Procedure, RSP 100 - Radio Equipment Certification Procedure. 3.1.2 Radio Standards Procedure, RSP 101 - Application Procedure for Planned Radio Stations Operating on Frequencies below 960 MHz. 3.1.3 Radio Systems Policy, RP GEN - Spectrum Policy Principles and Other Information Related to Spectrum Utilization and Radio Policies. 3.1.4 Spectrum Utilization Policy, SP GEN - General Information Related to Spectrum Utilization and Radio Systems Policies. 3.1.5 Spectrum Utilization Policy, SP 896 MHz - Spectrum Utilization Policy for the Fixed, Mobile, Radiolocation and Amateur Services in the Band 896-960 MHz. 3.1.6 Canada Gazette Notice No. DGTP-007-94 - Proposal for Implementation of Narrowband Personal Communications Services in the 900 MHz Range. 3.1.7 Radio Standards Specifications, RSS 134 (Provisional) - Narrowband PCS in the 900 MHz Band. 3.1.8 Client Procedures Circular, CPC-2-0-03 - Environmental Process, Radiofrequency Fields and Land-Use Consultation. 4.1 The frequency bands will be channelized as shown in Figures 1 to 4 to provide for fourteen channels of 50 kHz at 940-940.7 MHz paired with 50 kHz channels at 901-901.7 MHz; sixteen channels of 50 kHz at 930.2-931 MHz paired with 12.5 kHz channels at 901.7-901.9 MHz; ten channels of 50 kHz unpaired at 930-930.2 MHz and 940.7-941 MHz; and eight channels of 12.5 kHz unpaired at 901.9-902 MHz; for a total of 48 channels. 4.2 Except as provided for in paragraphs 4.3 and 4.4 below, in the border area (within approximately 120 km of the Canada/U.S. border) Canada and the U.S. each have the use of 24 channels on a primary basis as specified in Figure 2. 4.3 In the Toronto/Buffalo region, defined as the area within 120 km of the Canada/U.S. border and between 81 and 71 degrees West longitude, Canada has primary use of 29 channels as specified in Figure 3. 4.4 In the Detroit/Windsor region, defined as the area within 120 km of the Canada/U.S. border and between 85 and 81 degrees West longitude, Canada has primary use of 13 channels as specified in Figure 4. 4.5 It should be noted that the band 902-928 MHz, as stated in SP 896 MHz Section 3.4, is allocated to the radiolocation service on a primary basis in Canada. These radiolocation operations may take place along Canada's coastline including the coasts of Hudson Bay and James Bay and up the St. Lawrence River as far as Rimouski, Quebec. Marine radar in this band could have an effect on the adjacent narrowband PCS of 901-902 MHz. 4.6 Adjacent channel considerations should be taken into account when using the PCS bands 930-931 MHz and 940-941 MHz in order to avoid causing interference into systems operating in adjacent bands. Applicants planning to use these PCS bands should contact the local Industry Canada office prior to finalization of their sites for base stations. 5.1 Stations transmitting in the 901-902 MHz band and all mobile stations in the 930-931 MHz and 940-941 MHz bands are limited to 7 watts effective radiated power (ERP) (11.5 watts EIRP). 5.2 In major urban areas (see Annex 1), and any other areas determined by a Regional or District Office of the Department where there is intensive use of the 930-931 MHz and 940-941 MHz bands, base stations will be limited to 1600 watts ERP (2.6 kW EIRP) and an effective antenna height above average terrain (EHAAT) of 180 meters. 5.3 The effective height of the antenna above average terrain (EHAAT) is the average of the antenna heights above the average terrain (HAAT) for eight radials spaced every 45 degrees of azimuth starting with true north. The height of the antenna above average terrain (HAAT) is the height of the radiation centre of the antenna above the average elevation of the terrain between 3 to 16 km from the antenna. 5.4 A reduction in the above ERP is required for base station antenna heights in excess of 180 meters EHAAT as described in the table below. Notwithstanding the above, the ERP levels as specified in Section 5.2 may be maintained for the antenna main lobe provided that the ERP on the horizontal plane is reduced by the value given in the table below. This can be accomplished by such means as beam tilting. 5.5 In other areas of moderate spectrum usage (see Annex 1), or at any location outside those defined above in Section 5.2, the ERP may be up to a maximum of 2500 watts ERP (34 dBW) (4.1 kW EIRP). 12. St. Catherines/Niagara Falls, Ont. 1 For the purpose of this SRSP, harmful interference means interference which endangers the functioning of a radionavigation service or of other safety services or seriously degrades, obstructs, or repeatedly interrupts a radiocommunication service operating in accordance with regulations and technical requirements laid down by Industry Canada under the Radiocommunication Act. 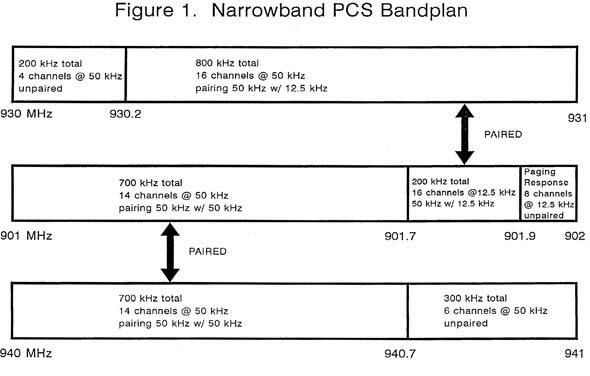 This chart shows the channelization for the narrowband PCS bandplan. The frequency bands are channelized to provide for: fourteen channels of 50 kHz in the range 940-940.7 MHz (giving 700 kHz of spectrum in total), paired with 50 kHz channels in the range 901-901.7 MHz; sixteen channels of 50 kHz in the range 930.2-931 MHz (giving 800 kHz of spectrum in total) paired with 12.5 kHz channels at 901.7-901.9 MHz (200 kHz of spectrum in total); four unpaired channels of 50 kHz in the range 930-930.2 MHz (200 kHz total) and six unpaired channels in the range 940.7-941 MHz (200 kHz total); and eight unpaired paging response channels of 12.5 kHz in the range 901.9-902 MHz. This chart shows the general Canada/U.S. 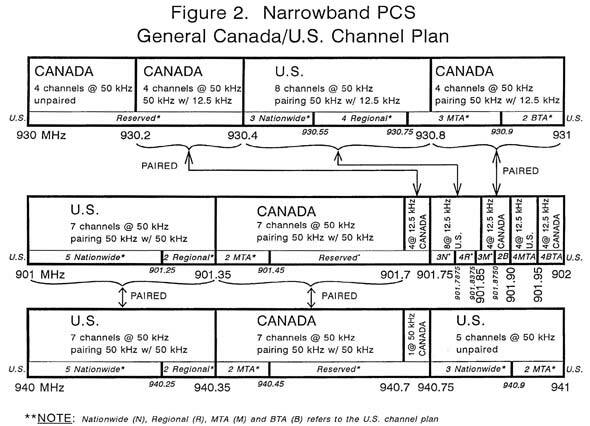 channel plan for the narrowband PCS bandplan within approximately 120 km of the Canada/U.S. border (with the exception of the Toronto/Buffalo and Detroit/Windsor regions). The channels and frequency bands allotted to Canada are: seven channels of 50 kHz at 940.35-940.7 MHz paired with 50 kHz channels at 901.35-901.7 MHz; four channels of 50 kHz at 930.2-930.4 MHz paired with 12.5 kHz channels at 901.7-901.75 MHz; four channels of 50 kHz at 930.8-931 MHz paired with 12.5 kHz channels at 901.85-901.9 MHz; five unpaired channels of 50 kHz at 930-930.2 MHz and 940.7-940.75 MHz; and four unpaired channels of 12.5 kHz at 901.95-902 MHz. The channels and frequency bands allotted to the United States are: seven channels of 50 kHz at 940-940.35 MHz paired with 50 kHz channels at 901-901.35 MHz; eight channels of 50 kHz at 930.4-930.8 MHz paired with 12.5 kHz channels at 901.75-901.85 MHz; five unpaired channels of 50 kHz at 940.75-941 MHz; and four unpaired channels of 12.5 kHz at 901.9-901.95 MHz. This chart shows the Canada/U.S. 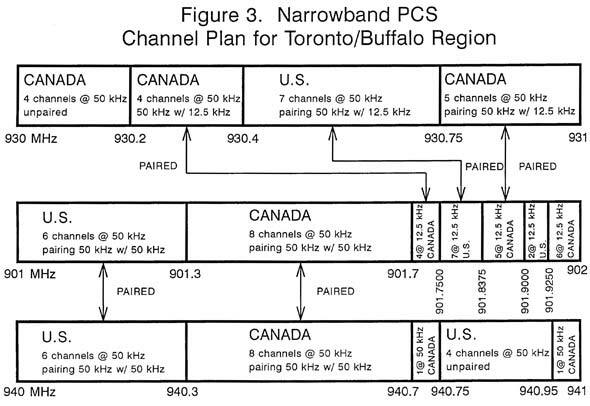 channel plan for the narrowband PCS bandplan for the Toronto/Buffalo region within approximately 120 km of the Canada/U.S. border. The channels and frequency bands allotted to Canada are: eight channels of 50 kHz at 940.3-940.7 MHz paired with 50 kHz channels at 901.3-901.7 MHz; four channels of 50 kHz at 930.2-930.4 MHz paired with 12.5 kHz channels at 901.7-901.75 MHz; five channels of 50 kHz at 930.75-931 MHz paired with 12.5 kHz channels at 901.8375-901.9 MHz; six unpaired channels of 50 kHz at 930-930.2 MHz, 940.7-940.75 MHz and 940.95-941 MHz; and six unpaired channels of 12.5 kHz at 901.925-902 MHz. The channels and frequency bands allotted to the United States are: six channels of 50 kHz at 940-940.3 MHz paired with 50 kHz channels at 901-901.3 MHz; seven channels of 50 kHz at 930.4-930.75 MHz paired with 12.5 kHz channels at 901.75-901.8375 MHz; four unpaired channels of 50 kHz at 940.75-940.95 MHz; and two unpaired channels of 12.5 kHz at 901.9-901.925 MHz. This chart shows the Canada/U.S. 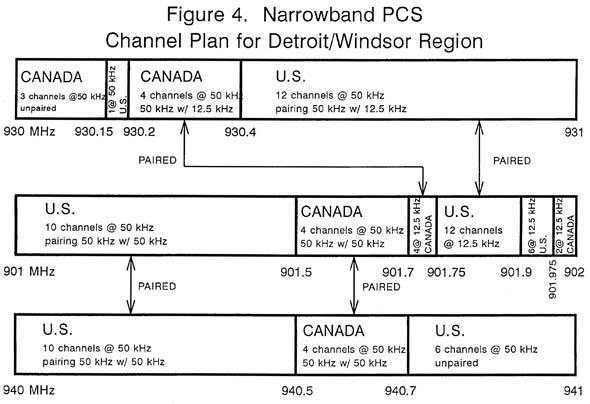 channel plan for the narrowband PCS bandplan for the Detroit/Windsor region within approximately 120 km of the Canada/U.S. border. The channels and frequency bands allotted to Canada are: four channels of 50 kHz at 940.5-940.7 MHz paired with 50 kHz channels at 901.5-901.7 MHz; four channels of 50 kHz at 930.2-930.4 MHz paired with 12.5 kHz channels at 901.7-901.75 MHz; three unpaired channels of 50 kHz at 930-930.15 MHz; and two unpaired channels of 12.5 kHz at 901.975-902 MHz. The channels and frequency bands allotted to the United States are: ten channels of 50 kHz at 940-940.5 MHz paired with 50 kHz channels at 901-901.5 MHz; twelve channels of 50 kHz at 930.4-931 MHz paired with 12.5 kHz channels at 901.75-901.9 MHz; six unpaired channels of 50 kHz at 940.7-941 MHz; and six unpaired channels of 12.5 kHz at 901.9-901.975 MHz.